When the author asked me to review Curbchek, I had no idea what to expect. It’s completely out of my comfort zone. I had nothing to compare it to. And the reviews I read didn’t make it any clearer for me at all. So for once, I started reading a book without any prejudices at all. And it turns out that is what saved the book. Had I expected convoluted plot twists, I would have been disappointed. A psychological thriller about a cop wrestling with his job and personal life? I probably would have been disappointed. Massive action? Nope, that’s not it either. So what is Curbchek? The only way I have of describing it is this: imagine a gruff fifty-something guy in a bar, talking about his life as a cop. He tells you about all of the things he came across while on the force over a beer. The stories are mostly one to three pages long, written in first person past tense, with a broad variety of subjects. There are drive-by shootings, robberies, gang wars, domestic abuse, murders galore… Our cop Zach has seen it all. Because I had no idea what to expect, and by not making wrong assumptions, I had fun while reading Curbchek. I had the feeling I was learning a bit about how being a cop works in the US. I learned what SWAT teams really do. I mean, we don’t even have those guys over here. It was interesting. But I did miss an overarching plot. The stories weren’t really going anywhere. The first and the last could have been swapped and no one would notice the difference. I like to have something to cheer me on through the last fifty pages, but it was just Zach and me, on our bar stools. The writing is simple, but does contain quite a bit of cussing. There are some pretty dark stories in here, that might not be for the faint of heart. If you want to spend an evening with Zach, try Curbchek. He has a lot of stories to share. 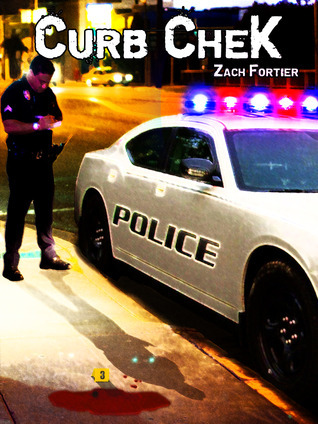 Curbchek is the story of a damaged cop, Zach Fortier. Fortier worked in the police department for the city where he grew up. One foot in the world of the cops, courts and legal system. The other in the world of gangs, drugs, thugs and street violence. Where the laws and rules are made by the strongest, the schemers and the most brutal. Read about the transformation of Fortier from a green rookie to a damaged paranoid veteran seeing danger in every situation. Follow along as he walks this tight rope. Trying to make difference, breaking the laws he promised to enforce. This is a story of law and order uncensored.